The drug company CEO who jacked up the price of a life-saving drug is now in jail on securities fraud charges. Federal agents arrested Martin Shkreli at his Manhattan apartment Thursday. Shkreli came under fire last spring for raising the price of a drug used by AIDS patients 5,000 percent, shortly after he took over a pharmaceutical company. Thursday's charges have nothing to do with that. The accusations are that he operated a Ponzi scheme when he ran a New York hedge fund. "He lied to the investors in both funds as to how the investments were doing. And in the instance of MSNB Healthcare, he lied to them about what he was actually doing with the money," said United States attorney Robert Capers. The 32-year-old Shkreli once called himself the "world's most eligible bachelor" on Twitter. He's now in custody, awaiting his first court appearance in New York City. A tweet from the FBI about Shkreli has been retweeted more than 10,000 times in less than an hour. 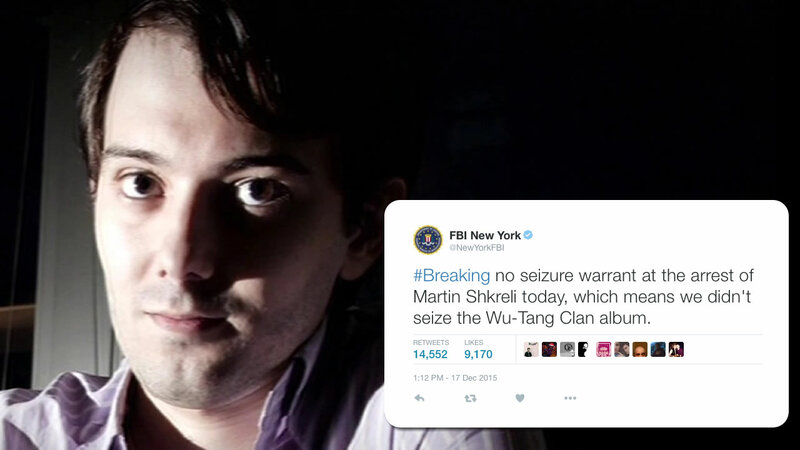 The FBI said they did not have a seizure warrant, so they did not seize the Wu-Tang clan album when they arrested Shkreli. The question arose because it's the only copy of the album. Shkreli paid $2 million for the album. The proceeds were donated to a Bay Area charity.